Scheduled keynote speaker Robin Wall Kimmerer. The theme of this year’s symposium is “Articulating Indigenous Identities across the Seven Generations”. The line-up of workshops and presentations at the Indigenous Women’s Symposium at Trent University Feb. 9 and Feb. 10 is proving to be a hot ticket, with the planning committee dealing with a happy, but unexpected, wrinkle of their own success. They have almost doubled the number of registered participants than they anticipated. Fortunately, that success has also brought donations from unexpected quarters to help organizers stretch the budget. They don’t want to turn away anyone who wants to take part, said Nahannee-fé Schuitemaker, spokesperson for the committee. The theme of this year’s symposium is “Articulating Indigenous Identities across the Seven Generations”. Schuitemaker said the theme will be a reflection on this fourth generation, and the influences on our contemporary Indigenous identity by the three generations of ancestors before us. And it will be a reflection on our influence on the Indigenous identity on the three generations of descendants to come. Schuitemaker says the topic of identity is going to be more and more important in years to come, with Indigenous peoples needing to break out of the circles, and break free of the labels, that have been forced upon them. She said the issues around identity is spoken about in hushed tones, currently. Friends and colleagues around the table tell her there is no safe space to talk about it, with the public discussion often becoming hurtful and exclusionary. Schuitemaker is new to the annual symposium having just moved to study at Trent University for her Ph.D in the Indigenous Studies program. She will graduate in May from the University of British Columbia having successfully defended her Masters thesis on the stories of urban mixed blood women and how they identify with their roots and how they connect to the land. So, of course, the theme of the symposium was of special interest to Schuitemaker as her Ph.D studies will continue from her Masters research. The symposium is the legacy event of Elder Edna Manitowabi, who retired in 2004 from Trent U where she taught, researched and developed courses in Aboriginal Theatre, Aboriginal Women’s Studies, and Indigenous Knowledge, and Culture and Community. She is an Anishinabek knowledge holder, traditional singer, storyteller and performer originally from Wikwemikong Unceded Indian Reserve. As a long-time advocate, she wanted to celebrate Indigenous women, so initiated the symposium in the early 2000s. Manitowabi will be in attendance this year. While the symposium has, in the past, been primarily a local event, said Schuitemaker, this year it is attracting registration from as far away as both coasts. Schuitemaker is particularly excited about the Friday night keynote speaker Robin Wall Kimmerer. “I almost lost my mind when I found out,” she said. Schuitemaker said she doesn’t “fan girl” over movie stars, but Kimmerer’s book Braiding Sweetgrass: indigenous wisdom, scientific knowledge and the teachings of plants “changed my life”, saying it is a must read for anyone, and not only Indigenous people. The book weaves the author’s personal stories into a discussion of walking in two worlds, the struggle of carrying the Indigenous perspective in a non-Indigenous dominated society and within the world of academia. Schuitemaker said she has gifted the book to people at least a dozen times. She intends to bring her own dog-eared copy to the symposium to show Kimmerer the effects her words have had on her. 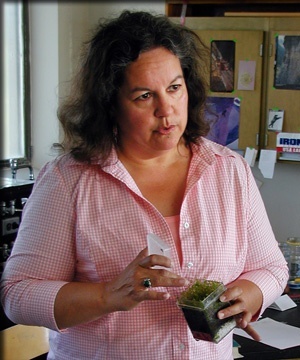 Kimmerer (Potawatomi) is a botanist, a distinguished teaching professor and director at the Center for Native Peoples and the Environment in New York. She has taught courses in botany, ecology, ethnobotany, Indigenous environmental issues, as well as a seminar in application of traditional ecological knowledge to conservation. The workshops and presentations will range from academic to grassroots-based. One of the presentations on the youth programming agenda will be from three girls from Attawapiskat, Ont. and their mother, co-founders of Young Warriors of Turtle Island. They will speak to the impact of residential schools, First Nation youth suicide, children in care removed from their communities, the disparity of education funding, and missing and murdered Indigenous women and girls. They have developed a tool to guide young people’s reconnection to their histories, cultures, languages, communities, Elders and other First Nation experts. Schuitemaker said it’s heartbreaking that children of such a young age—the oldest of the girls is 13—would have to deal with such weighty concerns, but it’s also powerful that young people are aware and prepared to work to make important changes in their own lives and the lives of others. Schuitemaker says she hopes that the variety of workshops and presentations, be it for adults or youth, will foster open hearts and open minds about identity to the benefit of the next generations. “We are many stories,” she said, based on individual beliefs, individual teachings and what has been taken away from Indigenous peoples.